Coach Komen has been offering personal running coaching since 2008. These are a selection of testimonials from past and present trainees alike. Before I began working with Coach Wilson, I had only one marathon under my belt and was 8 minutes shy of qualifying for the Boston Marathon. I signed up for the Marine Corps Marathon with the hopes of running down a qualifying time. I travel regularly for work, so eventually my training slipped, and I missed the first 3 weeks of training. I approached Coach Wilson, panicked that I had no shot at qualifying and that it was too late to achieve my goal. He laughed, told me to be positive, and assured me that we would give it our best shot. I looked at him with skepticism, and decided to sign on. I began training and was surprised that he wasn’t having me do extreme mileage to cover the time that I lost. Instead, it was doable mileage that was catered around my travel schedule. I very frequently had questions, and Coach Wilson was not only available to answer them but also was always eager to talk or email. As a coach, his principles are simple and effective. He constantly reiterates discipline, rest, and consistency. One of my favorite aspects of his coaching was his emphasis on mental strength. Going into the training, I was stressed and doubtful of my ability to qualify. Very quickly, Coach Wilson sat me down and taught me to see the joy in running and the benefit of a positive mindset. On race day, Coach Wilson was my biggest fan. He got me ready physically and mentally, and he gave me a race plan that he insisted I was capable of conquering. I trusted his support, qualified for Boston, and felt great at the end! I can’t wait to sign up for another race and have Coach Wilson help me with my next goal. He is truly dedicated to the success of his runners, and he has a great ability to understand each person’s strengths and weaknesses. He’s changed my mind set about running, and I’m so excited to continue working with him! I started running at the age of 43. Before I started my training with Coach Wilson, I had completed 15 half marathons. When I was almost 50, I trained on my own and completed my first marathon, the 2015 Marine Corps Marathon in Washington, DC. It was a very difficult race, and I completed it in 6:05 hours. I attempted to run again at the Baltimore Marathon, and I finished in six hours. I was not happy about the time, so I ran the Dallas Marathon and finished in 5:16 hours. It was very encouraging to me that, finally, I was able to move from 6+ to 5+ hours. I dreamed about finishing the 50 states and the Abbott World Marathon Majors (Chicago, New York, Boston, Berlin, Tokyo, and London). Coach Wilson was so positive, and he was not concerned about my age (52 years) or my BMI, which was more than 26 at that time. Furthermore, I was impressed with his simple approach. I started training with him in April 2018, and so far, I have finished 3 marathon races with a personal record of 4:34 hours in the Missoula, Montana Marathon. Coach Wilson is easy to approach, and he has remained engaged throughout my training. He is very accommodating about my travel, and at a very short notice, he can adjust my training to accommodate it. Training with him in less than a year has improved my form, confidence, and performance, and I am learning a lot from him in all facets of running. I was lucky to find him, and I look forward to his continued guidance as I work toward my goal of breaking four hours in the marathon. I came to Coach Wilson with roughly 22 years of running experience behind me. However, in all that time, I never really learned how to run—how to prepare for individual workouts, how to maximize each of those workouts, and, most importantly, how to race. It sounds almost too neat to say that Coach remedied all of those problems, but that is the truth. Really, it is. In a few short months, Coach taught me how to use every workout—from a long slow distance run, to a track workout, to a recovery jog—as a way to prepare for competition. In the time that I have worked with Coach Komen, he has helped me achieve three Boston Marathon qualifying times while also helping me consistently achieve new PRs in both the half marathon and ten mile distance. All of this, I should emphasize, has occurred in my late 30s. Wilson’s kind, generous guidance has entirely revised my understanding of running as a sport and as a lifestyle. Truly, Wilson Komen has become one of the most significant teachers in my life, and I cannot wait to see how much more I can learn from him. Before working with Coach Wilson, I had about 7 years of running and racing experience under my belt. I was an average female runner, who primarily ran for fun. My personal records up until that point where 1:54:57 on my half marathon and 4:23:46 on my marathon. My training plans leading up to my races were relatively unstructured. I knew that if I wanted to take my running to the next level, I needed to get on a more structured training plan. Coach Wilson came highly recommended to me from my brother, who had been training with him. I live in New York City, so I signed up for online coaching with one in person training session per month. This plan worked great for me. Coach Wilson put together a very comprehensive and customized training plan that worked around my work travel schedule. The training plan kept me challenged but was also attainable even with my long work hours. Based on my feedback from my training run log and weekly email check-ins, Coach Wilson made adjustments to my training plan to ensure it was optimized to meet my training needs. Once a month I traveled to DC to run with Coach in person. During our one-on-one runs, Coach Wilson observed how I was running and gave me tips on my form and running approach. I recently ran the Chevron Houston Marathon, 5 months after I started training with Coach Wilson. The weather forecast predicted a rainy windy race. Prior to race day, Coach Wilson put together a structured race strategy plan, and he took the time to prepare me mentally for the poor weather conditions. 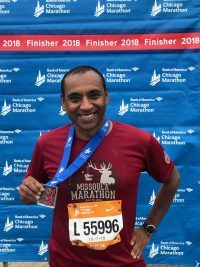 On race day I felt in control during the whole race, and as I was faced with challenges due to the weather, I was able to make adjustments along the course to run a strong race. 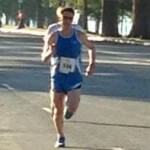 I finished in 3:47:49–35 minutes faster than my prior personal record. I am so excited about my progress under Coach Wilson’s training, and I can’t wait to run my next race! I plan to continue training with Coach Wilson for many years to come. I highly recommend Coach Wilson. He really cares about his runners and he takes a very personal approach to help them reach their goals. Prior to training with Coach Wilson, I was running marathons in over 4 hours. After training with Coach Wilson, I ran the 2010 Miami ING Marathon in 3:28. I lowered my PR by 43 minutes. Coach Wilson’s approach sets him apart from other coaches. He takes a very personalized and tailored approach, and he is extremely responsive and accessible. Coach Wilson runs with me and is therefore able to observe my form and help me improve it. He advises me on what gear to use. He developed a highly tailored program for me and adjusted the program on a real time basis. He also helped me through setbacks. Most importantly, he has helped me accomplish my goals. As someone very new to running (less than a year), I was interested becoming a more efficient and stronger runner, while reducing the opportunity for injury. Until I started working with Coach Komen in the spring of 2011, I would have never thought I would be capable of completing my first half marathon four months later. Coach has provided his expertise in an incredibly patient and upbeat manner in myriad ways: several personalized training plans incorporating a great variety of workouts; follow-up and question and answer sessions in person, over the phone, and email; and some really challenging (and fun!) morning personal training sessions. He always made time for me, and as a beginner to this sport, this kind of attention was invaluable. I am addicted to the feelings of accomplishment, energy, and positivity that come from a great run, and I am lucky to have access to a dedicated professional who is committed to helping me become a better runner and who also passes on the joy of the sport. After seeing the life changes running has provided, I am excited to keep growing and moving forward, and having Coach Komen by my side. I have personally witnessed how Wilson’s training methods and dedication have produced positive results while reducing risk of injury. This, coupled with his ability to relate these qualities to others, make him an excellent coach. I chose to work with Coach Wilson to beat my personal marathon record and to qualify for the 2013 Boston Marathon. When I ran my first marathon (ING NYC Marathon), I missed a Boston qualifying time by almost 5 minutes. Thinking that there was no way I could run faster, and with the Boston Marathon increasing the qualification requirements for 2013, I knew I needed some serious guidance and a new approach. After hearing positive feedback from a friend, and reading multiple testimonials, I chose to hire Coach Wilson for my second marathon. Coach Wilson designed a training and nutrition plan that was challenging but also attainable given my aggressive work and travel schedule. He understood the importance of a work-life-running balance and maintained a training program that accommodated my busy travel schedule. At times I questioned if I should be doing more, whether it was running longer or increasing my speed. Coach Wilson insisted that if I stick to the schedule and stay healthy, I would hit my goals in the race without a problem. If small injuries or pains came about, Coach Wilson knew exactly what to do to minimize the wear on my body and to help guide me to recovery. His approach focused on rest, recovery and avoiding injury at all costs, even if that meant sacrificing a few days of running now and then. Ultimately, I ended up running a 3:04:28 in the California International Marathon, beating my previous PR by over 10 minutes, and qualifying for the 2013 Boston Marathon. Coach Wilson’s training program and race strategy allowed me to enjoy the race, feel healthy throughout it, and finish strong. I highly recommend Coach Wilson. I could not have achieved this goal without him. I came to Coach Wilson with a relatively small amount of running and racing experience but with fairly ambitious road racing goals. I wanted to work with someone who could structure a program to help me hit my short-term goals in the marathon and half-marathon, and also help me improve over the long-term to become more competitive in these events. Coach Wilson’s program is very comprehensive and touches on all aspects of the running lifestyle. Most importantly, Coach Wilson takes a very personalized approach with his program. We run key workouts together and he makes constant adjustments to the training plan based on his observations and my feedback. Coach Wilson also structures a race strategy for goal races helping me me stay focused and perform at my maximum level. Over the past 2 years of working with Coach Wilson, I’ve been able to improve my half-marathon and marathon PR’s to 1:20 and 2:51 respectively. I am very excited about the coming season and my next set of races. With Coach Wilson’s support, I am looking forward to another year of big improvements. With Coach Wilson’s help, I believe I can really take my running to the next level, and I plan on working with him for many years to come. I strongly recommend Coach Wilson to runners of all abilities. 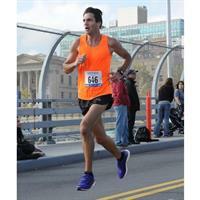 He is extremely knowledgeable and works hard to help his runners reach their goals. Coach Wilson is a fantastic coach, and I enthusiastically recommend him to anyone, beginner or advanced, who wants a professional, personally tailored training plan. I first met Coach a few days prior to running the 2009 Marine Corps Marathon. He provided me with a number of tips and recommendations on how to best survive my first marathon. I ran a 3:31, falling short of my goal of 3:30. Coach Wilson’s recommendations really saved me from ‘hitting the wall’ in my first marathon, and I decided to hire him to design my training plan in preparation for the 2010 Shamrock Marathon at Virginia Beach. Coach Wilson’s plan was perfect. He slowly and methodically increased my weekly mileage from 20 miles to 45 miles, and I did not suffer any injuries, despite doubling my mileage. Additionally he was always available via cell phone or e-mail if I had any questions about the training plan. As the training plan progressed, Coach Wilson incorporated speed and hill workouts into my routine. As my marathon date approached, the taper plan he developed was perfect, and I peeked on race day, running at 3:19, improving my previous marathon time by 12 minutes in just 6 months. Coach Wilson will develop a training plan that specifically addresses your strengths and weaknesses. If your goal is to run a PR, Coach Wilson will provide you the tools and expertise to achieve that goal.